Fights can sometimes be harsh. Like punching a stone within a marsh. Batman doesn't care - Robin just washed his hair - and Nobody is listening to some songs by Mike Larsh. But what are these guys listening too? Huh? 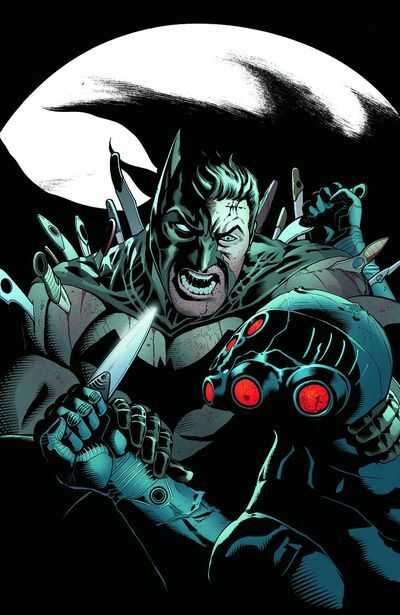 Writer: Peter Tomasi; Artist: Patrick Gleason; and Publisher: DC Comics in April 2012. In this full on action and adventure instalment of Batman and Robin, entitled 'Driven', we are presented with a dilemma, a battle, and an aftermath that will end all aftermaths. THE DILEMMA: With the masked git, Nobody, giving Robin the brat wonder the beating of his life. Do you think that Robins papa, Batman, will be able to reach them in time, and stop his kid from turning into couscous? THE BATTLE: As soon as Batman reaches Nobody's fortress, he kicks the living daylights out of his son's attacker, going so far as to nigh on kill him, by drowning Nobody in some green stuff in a barrel. THE AFTERMATH: Once the ground has settled, and Batman, Nobody, and Robin, are all waiting for the police to arrive, to take Ducard Junior into custody, the brat, the sod, the little git, does something very-very silly, CRACK! He show's Morgan first hand something that he has taught him - literally. The last sentence Robin mournfully utters to Batman says it all to me really "Forgive me, Father, for I have sinned". Because that really summed up what he did, huh? Also, I did like the pithy conversation between Morgan and Batman, just as the battle turned into Batman's favour. NOBODY: The world doesn't need a "Batman". It needs a Nobody. It has always been a nobody who rises from the masses to make things right! BATMAN: And it always takes a somebody to show them they're wrong, POW! Sound's like something you might hear in a movie, huh? As much as I am not a huge fan of Patrick Gleason's artwork, I have to say, that in this issue, his pacing and his style really did aide to what is just basically an all battle story-line. I particularly liked the rapid two and throw inter-cut scene at the beginning of this tale, plus the mood enhanced poses at the end. All in all this issue was just one big fight scene, where two leather clad adults beat the sh*t out of each other, until... err... Robin gives Morgan an Indian head massage, ha! Conceptually, this was not a story-story, rather a lead up to one hell of a conclusion. STORY: The cliff-hanger is the clincher for me in this issue. What next, huh? What can Batman possibly do to punish Robin for what he has done? Send him to his room without any supper? Suspend his allowance for a week? Maybe he can send him on one of those 'Brat Camps' you see on television? Hmmm - that's not a bad idea, is it? ART: As I said previously, the overall vibe and pacing to this tale was very-very nice in its execution. In many ways, Patrick's panels reminded me of a surreal spaghetti western, where two opposing outlaws throw it down 'big time' to save the day. Moreover, the overall high contrasting vibrancy of the colours acted very well in conjunction with this, although it was slightly murky at times. BATMAN: I am kicking it back 'old-school' with this version of Batman. Personally speaking, I would have always liked to have seen a young Burt Lancaster play him you know. It could have worked back in the day. ROBIN: Again, keeping to the old-school theme, I would have to say that a young Mickey Rooney was a spit for this brat of the Bat. Wouldn't you? You Think Your Child Is Bad? Batman's Son Does A Real Mean Spam Slap. As much as the majority of this story was a fairly nice read, compared to most 'all battle issues', if it was not for the ending... pow... it would be pants. I just hope that next month's installment is able to continue this motion, and that we can see some major repercussions where Damien's actions are concerned. Come back Tim - Batman needs you - hint, hint!